Abstract : Networked virtual environments like Second Life enable distant people to meet for leisure as well as work. But users are represented through avatars controlled by keyboards and mouses, leading to a low sense of presence especially regarding body language. Multi-camera real-time 3D modeling offers a way to ensure a significantly higher sense of presence. But producing quality geometries, well textured, and to enable distant user tele-presence in non trivial virtual environments is still a challenge today. In this paper we present a tele-immersive system based on multi-camera 3D modeling. 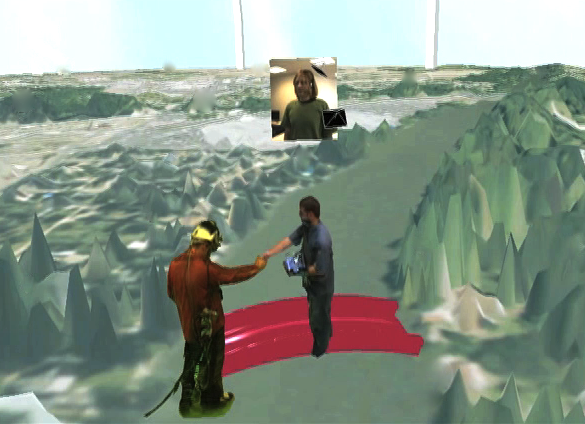 Users from distant sites are immersed in a rich virtual environment served by a parallel terrain rendering engine. Distant users, present through their 3D model, can perform some local interactions while having a strong visual presence. We experimented our system between three large cities a few hundreds kilometers apart from each other. This work demonstrate the feasibility of a rich 3D multimedia environment ensuring users a strong sense of presence.